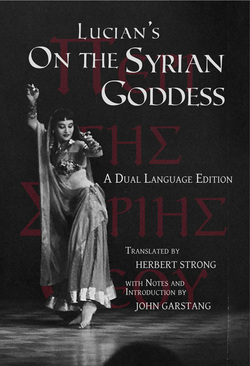 In On the Syrian Goddess (De Dea Syria), Lucian of Samosata presents an eyewitness account of the worship of Atargatis at the Sacred City of Hierapolis in Northern Syria. The subject of much scholarly debate over its authorship and authenticity, this text may be a lampoon of Eastern religion by one of antiquity’s great satirists. On the other hand, if it is authentic, it offers a rare glimpse into the little-understood world of ancient goddess worship. Describing a cult considered ancient and mysterious even in his own time, Lucian presents scenes of orgiastic luxury, gilded temples, bizarre divination, sacred animals, phallic worship, transvestite priests, violent self-castration, and many other oddities that are sure to fascinate any reader. This volume presents Lucian’s Greek text, as edited by A. M. Harmon, with a parallel English translation by Herbert Strong on facing pages. This format will be useful to those wishing to read the English translation while looking at the Greek version, or vice versa. Also included are a biography of Lucian by Strong, as well as a thorough introduction and extensive footnotes by John Garstang.